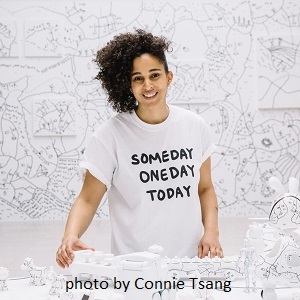 In addition to prestigious solo shows at some of the most renown art institutions including the 92Y Gallery in New York City, the iconic Albright Knox gallery and the MoCADA Museum, Martin has carved a path for herself that is as much intellectual as visual artist. During her two year tenure as a MIT Media Lab Visiting Scholar, Martin collaborated with the social computing group to use drawing as a medium to explore the interaction of social processes with physical spaces. At the Brown Institute for Media Innovation, Martin created a large scale wall installation and worked with the Institute’s research group to explore how visual and computerized storytelling might influence media and technology innovation.